Where do I start with this book? It was excellent, let's start there. While, for the most part, I don't feel like my life is out of control, it was good to hear confirmation that sometimes saying no to something good is not bad. Even if we feel guilty, it's not wrong. That was probably a key piece for me. Another thing I really liked about the book was the section on boundaries with children. Allowing children to be able to say no without fearing a loss of their parent's love enables them to be better equipped to have good boundaries when they are older. This doesn't mean the child is allowed to run wild with no discipline, to me it means that my child is allowed to not want something without me threatening not to love them. I don't know if that makes sense or not, I'm still not sure if I fully understand all of how it works. But it does seem that a child who was controlled and manipulated and not given choices in their early years can become a controlled, manipulated doormat when they become older because to refuse to do what someone said meant they were going to be unloved or anger was going to be unleashed and so they just go with the flow. And this can lead to harmful circumstances. Okay, just read the book to fully grasp that. There's also a really good chapter on Boundaries and the Digital Age, not letting technology control you and being able to go offline for a few hours or days without going crazy and not being deathly afraid you are missing out on something. Another good chapter is on Boundaries and Yourself. Ways that we can be out of control of our own lives include food, money, task completion, time management, sexuality, and words. 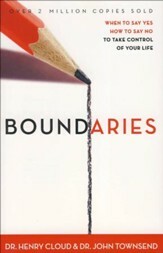 John and Henry give you ways of identifying a lack of boundaries and ways to establish boundaries with yourself. This was a very good book and I would especially recommend it to anyone who feels like their life is out of control and they feel powerless to change it. I feel that this book is very Biblically based, otherwise I would hesitate to recommend it.